Yes, we’ve been absent for a long while. I blame living in a un-guestable apartment for the past three months. Not really being able to entertain resulted in us being rather uninterested in writing about entertaining. 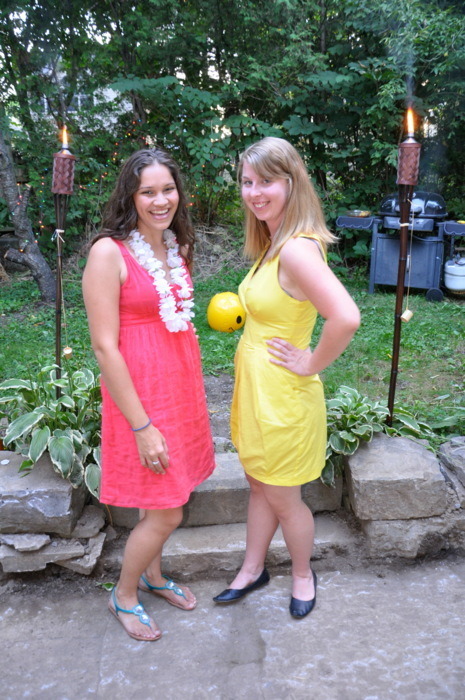 In August we hosted a Spooky Luau. I forget why we made it spooky but it was a Luau because we wanted to decorate our backyard with tiki torches and make our kebabs again. The torches also made for a great photo shoot. As you can see our backyard was in somewhat of a jungle state however we spruced it up with some Christmas lights and of course the tiki torches which we found at Canadian Tire for $10 each (plus the cost of tiki-torch-citronella-oil). 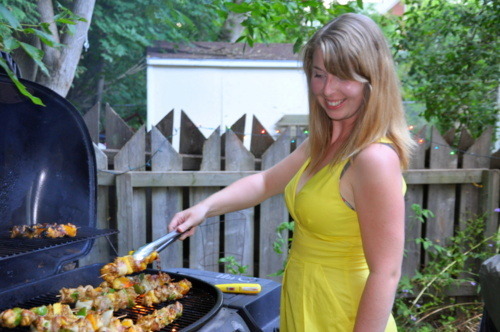 The kebabs were a great hit as usual. We practiced cooking-in-party-dresses with success! Some activities included piñata smashing, fireworks, sparklers, Up Jenkins, and late night cupcakes (the cupcakes deserve a post of their own).